(NaturalNews) I've often said that 72 hours after EBT cards stop working, every U.S. city will collapse into chaos. In case you're not familiar with the term, EBT cards are "digital food stamps." Nearly 50 million Americans are right now using EBT cards which are automatically refilled each month with welfare money the government doesn't have, increasing the national debt. Under Obama, food stamp enrollees have exploded. The annual usage statistics for food stamps are found here, but you can't see them because under the Obama administration's contrived "shutdown theater," the USDA.gov website has been taken offline. Note, of course, that the food stamp program itself is still online (most of the time), thereby proving there really isn't a "government shutdown" as claimed by Obama. There, you can clearly see the explosion of food stamps under Obama, who has more than doubled the number of Americans on the program. That's considered "economic growth" by democrats, by the way: the more people who subsist on government, the better the economy. "While the system is now up and running, beneficiaries in the 17 affected states continue to experience connectivity issues to access their benefits," stated a food stamp official in an AP story. The story goes on to say, "Typically when the cards aren't working retailers can call a backup phone number to find out how much money a customer has available in their account. But that information also was unavailable because of the outage, so customers weren't able to use their cards." The feds said this was due to a "system update," but this is of course a lie. Then again, every computer system in government that crashes -- including the Healthcare.gov website -- is now said to be "fully functioning" as if everybody in government is tripped out on acid. Today's failure of the EBT card system is yet more evidence that the U.S. empire is rapidly falling apart. The disastrous launch of Healthcare.gov proved yet again that the Obama administration is utterly incapable of competently managing a simple R&D development project. And rather than trying to help Americans become more independent and self-reliant, Obama has worked hard to put as many people on social welfare programs as possible, vastly expanding the role of government to the point where millions of Americans no longer have any concept of having a job or supporting themselves. As an example of this, AP quotes a cashier named Eliza Shook who said, "It's been terrible. It's just been some angry folks. That's what a lot of folks depend on." And that's true. Without EBT cards, millions of Americans have no way to feed themselves. They depend entirely on government just to put food on the table. So when that government fails them, they panic. This is why I have long held that the day America collapses into chaos is the day when EBT cards go offline and stay offline for 72 hours. Technically, that's three days, of course, but you get my point. Because an exponential rise in debt cannot be sustained, at some point the U.S. government will simply collapse into financial default. Soon after, Martial Law will have to be declared in every major U.S. city to quell the riots. Imagine 50 million Americans going hungry and realizing their welfare food credits aren't going to be available anymore and you begin to get an idea of why cities will be nearly impossible to survive when the chaos hits. The impending failure of the federal government is now obvious to everyone. Even Ron Paul is now openly talking about the coming collapse of the U.S. empire, mirroring the overnight collapse of the Soviet empire in 1991, where that nation broke into twelve independent republics. Many people now believe the U.S. is headed for a similar outcome, and that such an outcome can happen virtually overnight. The crash of EBT cards could be the tumbling domino that sets this into action. Nearly every state already has a secessionist movement calling for independence, and the Tenth Amendment Center is leading the charge on state nullification of federal tyranny. Groups like the Oath Keepers are ready to step in and help establish local law and order in the short-term chaos that would follow a dissolution of the U.S. empire. Today, all that is left of America is a deeply-indebted welfare state run by a corrupt cabal of tyrants who have no moral authority, no faith of the People and no solutions. America has devolved into a corrupt, bankrupt, incompetent government tyranny headed for imminent collapse. 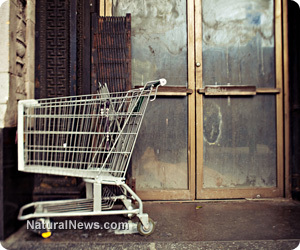 The coming EBT riots: What will happen when government entitlements stop?